As for your copyright question, not much has changed since we last discussed this issue. Repurposing legitimately-acquired t-shirts should not infringe copyright. However, the trademark rules are not as clear. Etsy and trademarks. An Etsy shop owner is at the mercy of two outside forces: Etsy and the offended trademark owner. Apparently Etsy will turn off access to shop items or even close down shops if a trademark owner provides sufficient notice for an “Intellectual Property Infringement” (as defined in Etsy IP guidelines). We’re a little confused by this policy because the term “trademark” never appears in the guidelines and the guidelines mirror DMCA requirements which are strictly for copyright. In addition, this 2011 statement by an Etsy in-house atorney states that Etsy doesn’t intercede between the shop owner and trademark owner; they just establish contact between the two. Nonetheless, there appear to be cases of Etsy closures and shutdowns based on trademark complaints. Considering the volume of complaints and Etsy’s desire to avoid liability for the site itself, we assume it makes more business sense to shut down an item first and ask questions later. Trademark law. 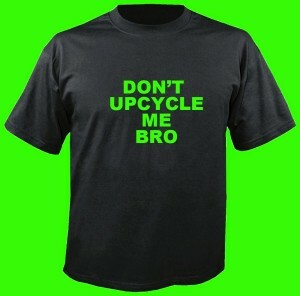 Upcyclers are in a gray area of trademark law. On one hand, anyone can resell authorized trademark goods under the principle known as trademark exhaustion. For example, a band can’t stop you from selling a collection of their used t-shirts. But upcycled goods — because they deconstruct legitimate goods to create new products — are not in the same category as recycled goods. For example, if the new products reflect poorly on the brand or if they trigger product liability issues — for example, a chair made from Sherwin-Williams paint cans — the owner may have a gripe that consumers will be confused or harmed. On the other hand, goods with no liability issues — for example, refrigerator magnets, kitchen aprons, or upcycled underwear — that are obviously not created by the trademark owner, are unlikely to be infringements. Bottom line dept. Even if you’re convinced you fall safely in the latter category (we think you do) we don’t recommend fighting the trademark owners. The battle will turn into a black hole and your store will suffer. We only wish more trademark owners would at least consider licensing before asking Etsy to close down stores.